Another highlight of my trip was an afternoon of lunch and shopping with my aunt’s cousin Lydia. It was nice to spend the day with a real Parisian, and a lovely one at that. I could exhale a bit and let someone else do the talking and expert maneuvering around Paris. Our first stop was the rather intimidating 24 Rue du Faubourg Saint-Honoré, home of Hermès. I simply could not go to Paris without stopping in there — if for no other reason than to say that I did — but I was happy to have my new French friend for backup. I considered buying a tie for Ed, but the one I liked the best is only available in the heavier silk twill, and I know that he would not have liked the thicker weight. 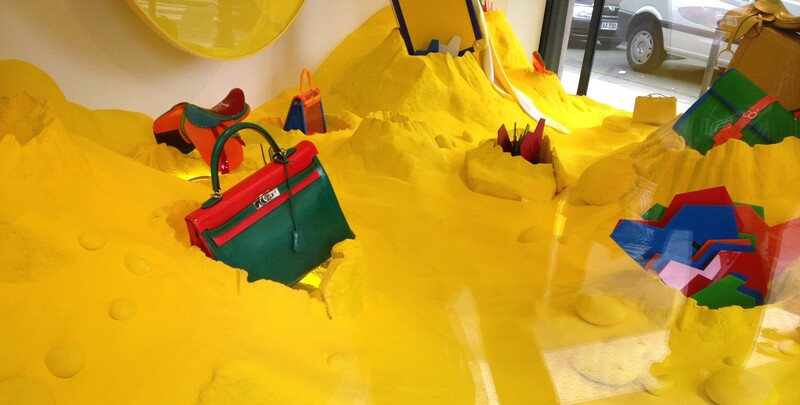 The legendary window display was a vibrant yellow, with Kellys in offbeat combinations of red and green, orange and blue. If we’re shopping with my imaginary money, I’d still probably get my Kelly in a practical black color. See? Even imaginarily rich, I retain my good sense. After Hermès, Lydia treated me to a fabulous outdoor lunch of beef carpaccio salad with shaved parmesan and mille feuille for dessert, and we headed to the world-renown Galeries Lafayette in search of a new handbag for moi. When we arrived at the Longchamp boutique, it was literally take-a-number-line-forms-here busy. Lydia told me that the Longchamp bags are really nothing special and not highly regarded among fashion savvy Frenchwomen, but very favored by foreigners. I read between the lines. She directed me to the Lancel section and told me Frenchwomen appreciate this brand which has been around since 1876 even though they have no presence in the US, and I immediately was drawn to the totes of their French Flair collection. Beautiful leather, beautiful hardware, and reversible (which I told myself would rationalize significantly blowing my self-imposed budget to Ed — if we think of it as TWO handbags instead of one, it’s almost a bargain, n’est ce pas?). I was happy to go for a bag which just felt better quality and aesthetically more “me.” It was a joy to shop with Lydia (don’t even get me started on the shoes! and the mustard!) and I look forward to her visit to the US later this summer. Ô Chateau’s Wine and Cheese Lunch has become a landmark for any gourmand traveler. We designed this tasting as a fun and different way to spend a meal in Paris. Instead of going to yet another restaurant, our Wine and Cheese Lunch is a great opportunity not only to taste good French products but also to get an education about them. The tasting starts at noon in a beautiful tasting room. We’ll taste five different wines, coming from five different regions of France. From Champagne to Bordeaux, from Sancerre to the Rhone… just sit back and enjoy this tasty Tour de France of wine and cheeses – O Chateau style! 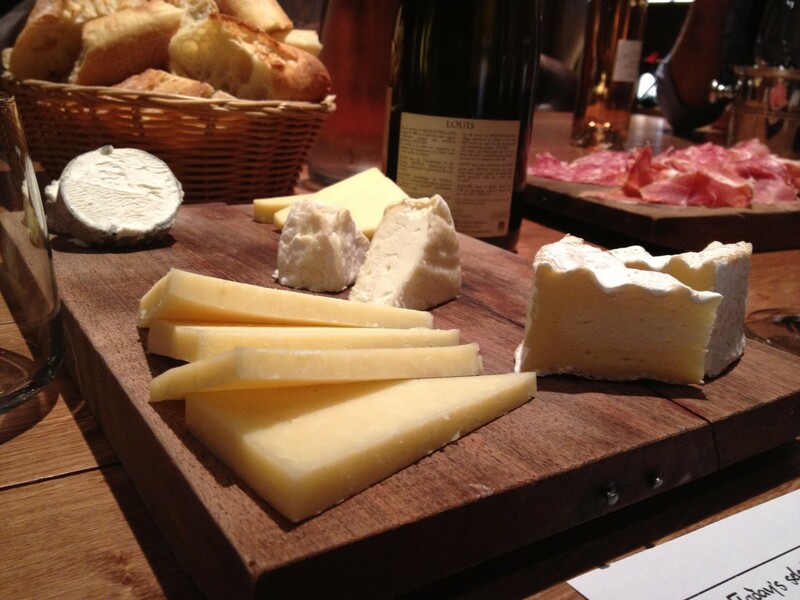 A day spent walking around Paris can sure create an appetite, so servings of wine and cheese are generous. Plus we add some charcuterie (smoked ham from the South West of France, saucisson from Corsica…) to bring even more joy and color to the table. I can assure you that this was every bit as fabulous as it sounds and definitely worth every euro. Sure, I am going to be absolutely insufferable at cocktail parties now, what with all my new found knowledge and dramatic affectations, but I accept that. The weather in Paris was on the rainy side during our visit, but it rarely ever rained for long. 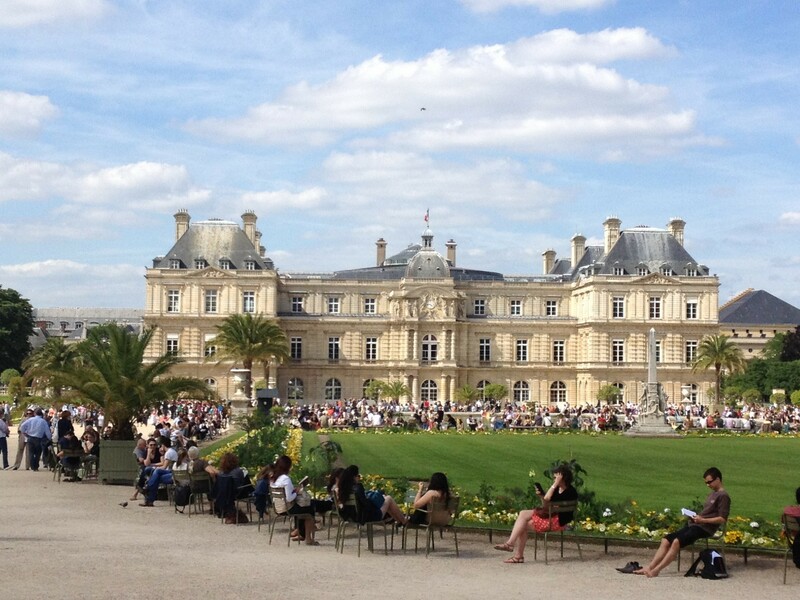 Sunday was our first truly legitimate 100% sunny day, and the Parisians finally shed their coats and scarves and lounged en masse at the Jardin du Luxembourg. It was lovely to see so many people at rest, soaking up the sunshine and relaxing so openly. Like so much in Paris, the scene below felt right out of a movie. On the way to the gardens, we saw a man riding a bike with his little dog in the basket. Then we walked by a woman resting her head on a man’s shoulder while he read a book of poetry aloud. Can I make up a more beautiful French scene if I tried? This entry was posted in Life and tagged Ô Chateau, Galeries Lafayette, Hermes, Jardin du Luxembourg, Lancel, Paris travel, Rue du Faubourg Saint-Honoré, wine tasting in Paris by Mom Mom's Apron. Bookmark the permalink.